I'm not the kind of shopper that likes to run all over town. I have 4 boys, ages 9 and under. Loading everyone up into the car to go get what I need at a million different stores is not my idea of fun. So, it should come as no surprise that online stores are my go-to. Online stores save me tons of time and usually some money too – in addition to gas in my ancient minivan. 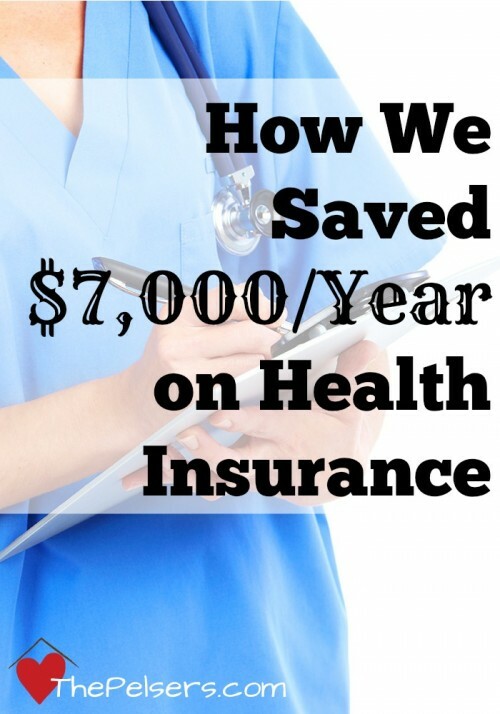 Such a sanity saver! 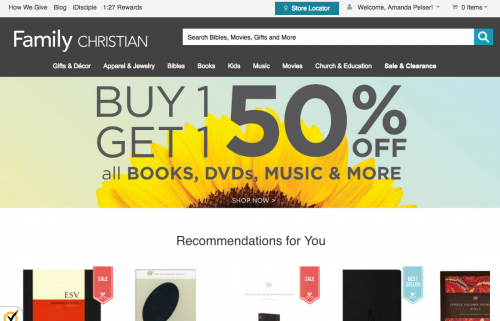 Family Christian asked if I'd take a look at their site and share my shopping experience with you. Perfect! Shopping online to get what I need without running all over town with little kids in tow. I'm in! First, the Family Christian website is really clean and crisp. The font choices and layout make it easy to scan their pages and look at the featured products. Searching is simple. 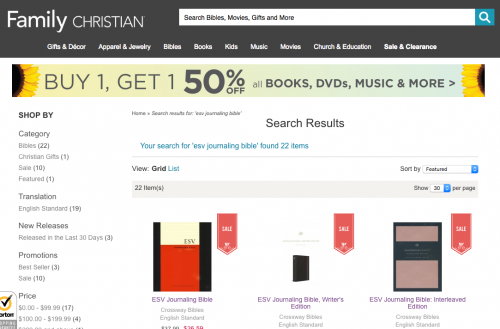 I've been wanting to buy an ESV journaling Bible. I typed “esv journaling bible” into the search bar at the top of the homepage and up came 22 results. I could easily scroll through looking at the pictures and titles to find the products I wanted to look at more details on. I looked at several different journaling Bibles before making my decision. I could read about the layouts and cover materials as well as see the dimensions of each one. 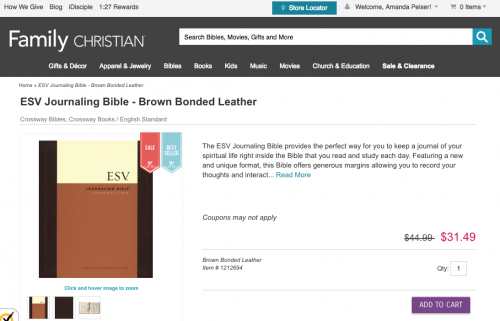 I decided to buy the ESV Journaling Bible – Mocha Brown Bonded Leather. 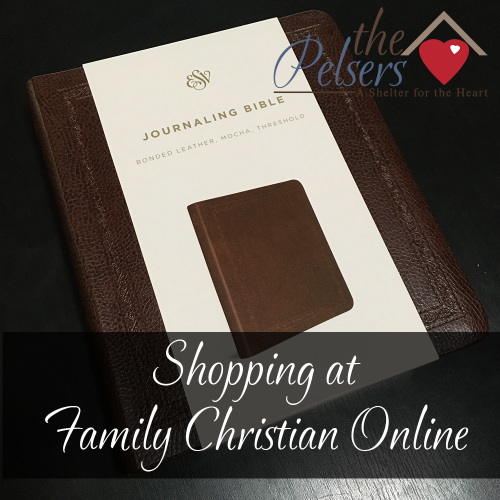 Family Christian is running a special through August 25, 2016 – 30% off on journaling Bibles! Score! Exactly what I was looking for at a great price! The checkout was easy – don't forget to sign up for an account so you can track your purchase. I also had a discount code emailed to me for signing up for a new account! I couldn't stack it with the journaling Bible sale so I saved it for later. Ready to shop at Family Christian? In addition to the journaling Bibles, there's a slew of books, movies, and DVDs for Buy One, Get One 50% Off until 8/25 too. 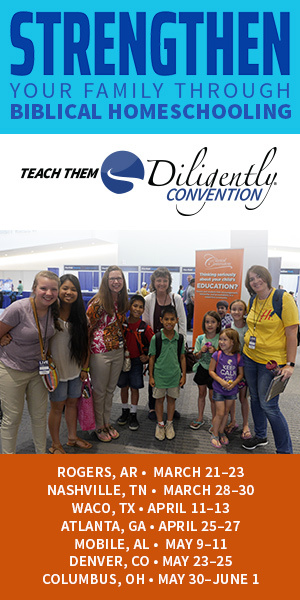 And did you know that Family Christian has a summer reading program for kids to earn free books? Disclosure (in accordance with the FTC's 16 CFR, Part 255: “Guides Concerning the Use of Endorsements and Testimonials in Advertising”): Many thanks to Propeller Consulting, LLC for providing this prize for the giveaway. Choice of winners and opinions are 100% my own and NOT influenced by monetary compensation. I did receive a sample of the product in exchange for this review and post. I think I’d like that same Bible! I would buy a daily devotional if I won. i would definitely get plates! The gold pearl earrings are very adorable! Thank you for the giveaway! I’d buy some Illustrated Faith products! I would buy a Bible study for the fall. I sold our farm after my husband passed away and just moved into a small house in the country. I would gett some Wall Art with a scripture. I would get my 11 year old her own bible. I would buy some worship music!! I have a few books that I really want to read, Uninvited being one. I would definitely buy books for me, there is never any money left for my books, all the money goes towards homeschool books, lol! Thank you for the giveaway. Oh my, so many choices! I like several of the T-shirts on the front page; might get one for each family member with the great sale! I would love a $25 gift card to Family Christian Store. I’d probably start by purchasing the Cave Quest music dvd. The kids and I had such a great time at our churches VBS this year and the music is such a fun way to bring back those memories of all we did and learned. I would buy some of their lovely Christian Adult Coloring books! Love them so much! I think I would buy a journal or a new cross pendant. This would be great for us. We are struggling right now. I would probably buy a bible for my daughter. I would use the $25.00 coupon toward DVD’s. I would buy books. Thanks for the generous giveaway.